The Tobeco Coil Jig is a handy, compact tool for all vapers who prefer building their own coils! Unlike the original version, this upgraded coil jig has been redesigned so that the tightening screw sits on the side (rather than on top) of the device - this makes wrapping coils much easier. Each coil jig comes with five small coil-wrapping posts with differing diameters, so that you can easily build coils of various sizes. 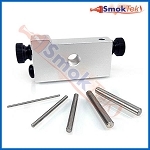 The coil jig features a 510-threaded opening on the body of the unit so that the jig can be used as an atomizer stand while you work on a build. Additionally, the small nut located below the screw on the left side of the device (this side features a protrusion on the top) can be pulled out to reveal a space which can be used to store your preferred post. Using the jig is easy: simply choose which coil-wrapping post you would like to use, unscrew the screw on the right side of the device (the side which is flat and does not feature a protrusion on top), insert the chosen post into the opening (you may have to exert some force when using the largest size post), and tighten the screw back in so that the post sits firmly in the jig and does not move. Then, take your kanthal wire and wrap one end around the base of the screw lodged on the left side of the jig and begin wrapping your coil onto the post until you have achieved the number of desired wraps. Diameter of posts included: 0.9mm, 1.5mm, 2.3mm, 3.1mm, and 3.4mm. The Tobeco Coil Jig V2 is available in several colors.